Found under the Accounting section of the Reports page, the Past Deliveries ($) report shows your program's recognized revenue. In other words, this report shows you the value of what you have delivered during the specified date range. If your season has not started, you will not see any data in this report. This report does not include the value of purchases made using Farmigo Credits. SPECIAL NOTE: At Farmigo, we charge for our services based on the value of deliveries recorded in our system. This report will help you to identify that amount and calculate the percentage owed to Farmigo each month. ﻿You may select a single delivery day or a range of days. The report will only show monthly totals within that range. The report will only include past delivery dates. You must limit the date range to no more than 3 months at a time. BREAKDOWN BY: Each Breakdown will show you totals at the top. Members - Subscriptions and Orders are broken out separately in this report. Starting at row 6, Subscription revenue will be listed by member. Scroll down to see Web Store revenue broken down by member. Each member is listed along with value of the deliveries that they've received for the defined date range. The members are listed alphabetically by last name then first name. TIP! 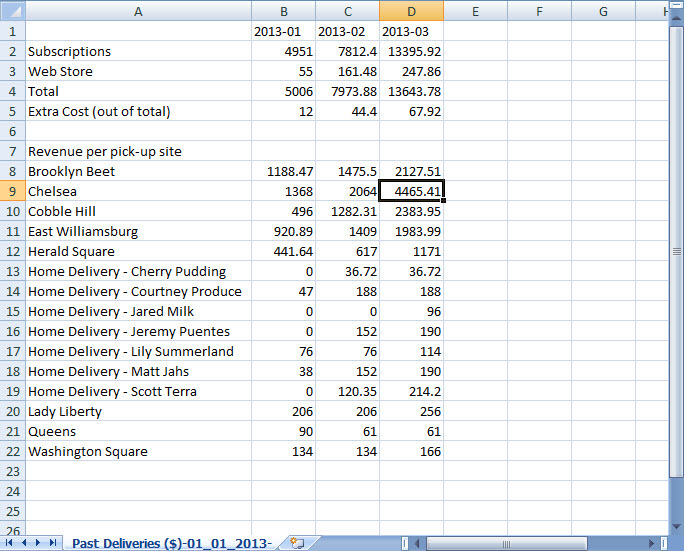 Sort the first column alphabetically to see the total value of deliveries received by a member side by side. Producers - See how much each producer is selling at your web store and how much they have contributed to your shares. The revenue earned by each producer includes the items that they have contributed to your boxes (from the Box Builder). Total revenue earned by all producers may not equal the total revenue earned from subscriptions and web store orders. Locations - Compare which locations provide the highest volume of sales based on total subscriptions and web store orders. Items - Learn which items (share, options, and items) bring in the most revenue. The revenue that each item has earned includes web store purchases and box contributions (i.e. in the Box Builder). Total revenue earned by all items may not equal the total revenue earned from subscriptions and web store orders. The report is downloaded as a CSV file, which is readable in most spreadsheet software programs, such as Microsoft Excel. The data is broken down by month and by subscriptions versus web store orders. Also, if you have added a per delivery fee to any of your locations, an extra line called "Extra Cost (out of total)" will be added to the breakdown at the top to summarize the total fuel cost fees charged during that time period. The fuel cost fees charged are included in the Total line. Below is an example of the Past Deliveries ($) report with a breakdown by locations.